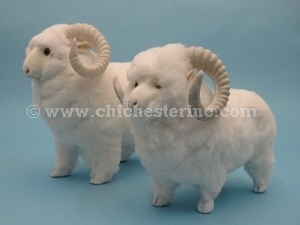 Great for display, these adorable little sheep figurines are made with genuine Tibet or Sheared Australian sheep fur. These are not subject to CITES or USFWS controls. Width between horn tips: 6"
See the left side and a size comparison with a 7" long ruler. See the left side and a size comparison with an 11" square mat. 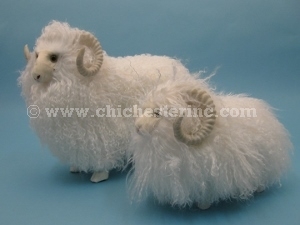 See the right side and a size comparison with a 7" long ruler.